Tommy came to a man's world to learn of kayak fishing armed with all the video knowledge he could find. Mother nature always tests the kayak fishermen and Tommy was about to pay his dues. He came with pictures of fish from legends of this magical place. His eyes were aglow . Kayaks everywhere he could see. He was surrounded by legends and history. Many men have come here and failed. Watched the water and winds for a couple of days .Then it was time to see what mother nature had to say . I guess the stars aligned . Launch time was go time as the Ocean came alive , birds went up to scout for us, the whale waved as it devoured a pile of bunker . I've never been in it so alive. Hard to decide which way to go ,which way to throw. Piles of bunker getting destroyed , bass slamming the kayak total chaos . No defined direction of anything ,bunker flying out the water bass flying out the water . Well they sure looked like bass but I later learned some Albies mixed in also . All this madness and I can't get a hit and this is all happening at 3+mph with the tide . Elias is grabbing fish here and there we're using the same stuff . I'm getting dinks he's getting meat . Not a problem , many pods plenty to work we split from each other and radio goes off "my days over " . Drive arm snapped .....Oh boy not now . We come prepared for these problems so when we do finally get out we can fish and enjoy it . After his drive down from Westchester Daimon was not turned around and sent packing because of a broken drive . He went on fishing . Got to move to another pod . As I hit the gas and get upwards of 3 mph , Bamm right rod snaps to attention I grab it set it and it starts peeling away from me . Easy 60 yards of line off the spool in seconds. Chaos turns into my happy place now ! Slow motion sets in . I don't know how to explain it to you .But when you feel it you'll get what I mean . It's a long way from my Kayak but I can feel the weight of it . Give it a couple cranks on the VS . Bad idea I woke her up again.30 yds gone . I don't want to pedal towards her don't want any slack at all . I take a line parallel to her to keep the tension on .Start to second guess , is it a bass ? Shark ? I am in the friggin Ocean . Weird fight starts .. slow reel in but now muscle memory comes in to play . Now I feel the motion of the fish , the rub of line across her head the slow swirl of the body as it's about to take off for anther run. It's what I felt and saw last time in the crystal clear waters. I know this feeling , my body knows it . With that 20 yds in front of my kayak I see a splash and roll of a fish but yet my hands and rod don't feel it . Huh ahh that's not my fish . Whew my line is still taught but it is coming up , I lower the rod tip in case she's thinking about one last jump . Holy chit ! As I see her surface and do a little wiggle that starts with a head shake as if to say I can't believe I'm caught . Deeper into slow motion I sink as I'm in total awe but she's still on her terms . We both know that . I reel her in for a closer look at the hook . Perfect set she's going no where as long as I keep the pressure on and she don't go nuts at the Yak . Tail-grab ? What are you friggin nuts your hand will never fit around it . Now memories of the last big one kick in , 2 miss grab of the mouth . This time I slide my hand down the leader , move her out from the Kayak and grab the bottom jaw with all my grip .Not a gripper my hand , in her mouth. Death grip ! To my surprise no fight no head shake she just looked at me . Test lift ...yeah this ain't going to work with one hand . Double grip lean way back slide her in and hope she doesn't jump out the other side . Success in my lap and she is huge ! Personal Best for me just got upped a notch. Wow that is life in a nut shell right there . So much emotional stuff going on in that 15 minute period .It's real hard to explain the passion I have for doing this and to be rewarded like this is just icing and a cherry on top. I was just grateful to get out , let alone catch the largest fish of my lifetime . Then to have one of you buddies capture the lifetime event with some great pictures , brings it all together and you share the moments because you both understand what it means to be able to accomplish it. Oh yeah now I'm 2.5 miles from where I started running with the wind and tide and I need to go the other way . Yup that's part of the passion also . Hate me if you will but this one will be printed and hang in my line of sight forever until if some day she is replaced . Yes the fight was great , is it over ? Not until I run the 2.5 miles back into the wind and tide while dragging this 47.5" personal best of mine back to the beach . Full moon fish came in to take a tour . Went out last week to teach my son how to work an area and use his Lowrance better . It is real hard to get a rhythm down and try to teach it to someone else. He is my son sooooo...after trying to work him into it and a damn fish hitting my tube almost every time , he was getting a little "me" on me. I always respect my elders. 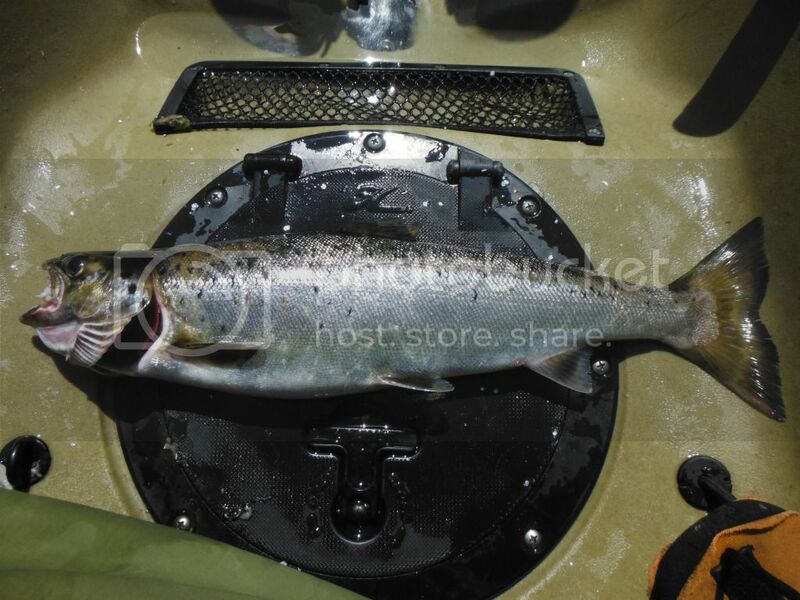 Pushing all limits: Elias’s 2014 Jamaica Bay Kayak Fishing Perspective. Got up and out of the house with only 3 hours of sleep (sons bd party). Great sunrise headed out with Jeff . Only 1 guy launched ahead of us ????? Are we on the wrong side ? Did we make a big mistake? am I still sleeping ? Round Valley Reservoir our closest freshwater gem. A few years ago my new obsession became kayak fishing. Starting in a paddle kayak then switching to pedal power allowed me to gain some experiences that might be valuable to people just starting in this amazing way to fish. KFA-NY takes Salem by Storm! A few KFA-NY members hit the waters of Cape May, NJ for a weekend of kayak fishing at the JCKF Kayak Fishing Jamboree, a kayak fishing tournament sponsored by Jersey Cape Kayak Fishing.